Wide Area Network (WAN) optimization has hit the mainstream. Many vendors have mobile clients, virtual appliances, and are building for cloud-enabled environments. 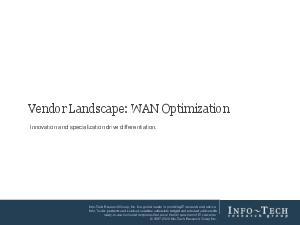 If you find yourself in need of a WAN optimization solution you’ll want to download this report to understand what’s new in the WAN optimization market, what vendors are the key players, and which products are most appropriate for particular use cases and scenarios.